David K. Bowman, 70, of Auburn, Wash., is a Vietnam veteran who retired from the U.S. Naval Reserve in 1991 after 25 years’ service, including 10 years in Naval Reserve Intelligence. In 2002 he retired from a 31-year civilian career with the State of Washington. Since his retirement, Bowman, 70, has been busy with his longtime preoccupation with the disappearance of Amelia Earhart, and has written more titles in that vein than anyone. Bowman’s books include Legerdemain: Deceit, Misdirection and Political Sleight of Hand in the Disappearance of Amelia Earhart (First Edition 2005, Second Edition published by Saga Books in 2007); The Story of Amelia Earhart (2012); SAIPAN: A Search for Amelia Earhart in Modern Saipan (2015); and Amelia Earhart Philately (Enlarged Second Edition): The World’s First Book on Amelia Earhart Philately (2016). 2012 was especially busy for Bowman, as he published two books unrelated to his Earhart work: Tales of Westpac: Memoirs of a Carrier Sailor of life on an aircraft carrier during the Vietnam War, and The Forgotten Stars: Great Forgotten Talents from the Golden Days of Motion Pictures. He tells me he’s working on yet another new book, A Waiting Dragon. To visit Bowman’s website, please click here. Bowman’s story, “The Psychic World of Amelia Earhart,” initially appeared in the June 21, 2009 edition of Wings over Kansas website, and he’s kindly allowed me to offer it to you today. All the photos, with the exception of the small shot of Amelia in white aviator’s togs, have been added here. On a stormy day in June 1928, the Fokker tri-motor Friendship dipped down out of a leaden sky to land in the bay near Burry Port, Wales. The airship taxied through the pouring rain to a nearby buoy and cut its engines. A moment later, crewman Louis “Slim” Gordon, opened a door in the fuselage, hopped out, and moored the ship to the buoy. At the controls of the airship was Wilmer “Bill” Stultz, and in the passenger compartment was a woman, who up until that flight, had been a recreational aviator and a social worker in Boston. On that rainy morning, however, she was catapulted to international celebrity. Her name was Amelia Earhart. A few months before, the young, boyish woman with tousled hair, had been asked to an interview by George Palmer Putnam, the wealthy and powerful head of G. P. Putnam’s Sons, publishers. An athletic adventurer, writer, and promoter, Putnam had been asked by wealthy New England socialite Amy Guest, who had purchased a Fokker tri-motor aircraft from Admiral Richard Byrd, to find a woman to fly across the Atlantic in that aircraft. Initially, Mrs. Guest planned to make the flight herself, to be the first woman to fly across the Atlantic, but had been pressured out of the flight by her worried family. A masterful promoter, George Palmer Putnam, or “G.P.” as he liked to be called, immediately seized upon the young Amelia Earhart at their first meeting. Earhart was tall, slim and had a remarkable physical likeness to recent aviation hero Charles Lindbergh, whose nickname was “Lucky Lindy.” Putnam instantly christened her “Lady Lindy,” a nickname that Earhart deplored. 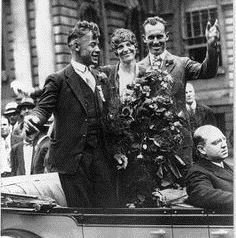 Wilmer “Bill” Stultz, Amelia and Louis Gordon bask in glory in New York after their transatlantic flight in 1928. The rest was history. Immediately after the flight of the Friendship, commemorative medals were struck and sold, and the young aviatrix embarked upon a number of product endorsements. At the same time, GP hustled his young protégé off to his luxurious estate, Rocknoll, in Rye, N.Y., so that she would have the privacy and peace to write an account of her famous flight. This she did, and before the end of 1928, 20 Hours, 40 Minutes was published. To this day, it is an important historical source and a sought after collectible. Earhart then embarked upon a lucrative and busy lecture tour to discuss her new book. Upon her return to New York, she was appointed Aviation Editor for Cosmopolitan Magazine. By then, in 1929, she was all the rage. Dissatisfied with being just a passenger on the first transatlantic flight — mere “baggage,” as she called it — Earhart determined to pilot the Atlantic Ocean herself and spent the next four years in preparing for this. Preparations were set back by a crash during a practice flight in Norfolk, Virginia in 1930, which necessitated lengthy repairs that weren’t completed until 1931. Shortly after the Norfolk crash, GP obtained a divorce from his wife, Dorothy, and the following February, in 1931, he and Earhart were married in a quiet ceremony. In May 1932, the aviatrix took off from Newfoundland and successfully crossed the Atlantic in 15 hours, 18 minutes, landing in a pasture in Londonderry, Ireland, and becoming the first woman to successfully pilot the Atlantic. In May 1932, Amelia soaks up the acclaim of the Irish as she prepares to take off from Derry, Northern Ireland, and fly on to London, where worldwide fame awaited. 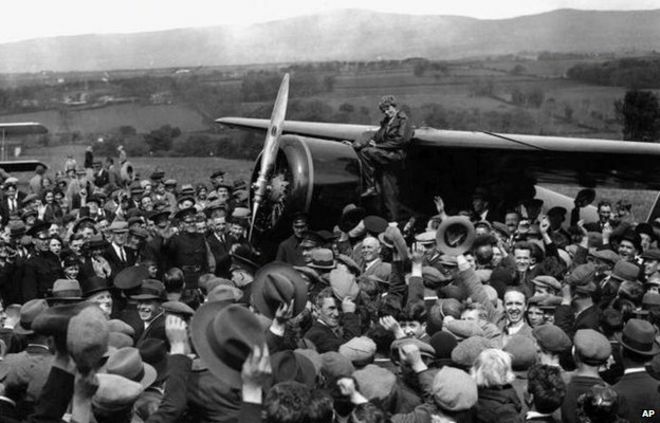 After a flight lasting 14 hours, 56 minutes during which she contended with strong northerly winds, icy conditions and mechanical problems, Earhart landed in a pasture at Culmore, north of Derry, Northern Ireland. The landing was witnessed by Cecil King and T. Sawyer. When a farm hand asked, “Have you flown far?” Earhart replied, “From America.” The site now is the home of a small museum, the Amelia Earhart Centre. Over the next five years, under GP’s guidance, Earhart set more aviation records, participated in various aviation events, continued to tour the lecture circuit, was the spokesperson for a multitude of products, and lent her name to several businesses. One of them was a line of women’s clothing, which she personally designed. Another was a high-quality line of luggage that continued be manufactured for years after her disappearance. Earhart also became actively involved in establishing commercial air routes and founding airlines. Beyond that, she was an ardent feminist in the best sense of the term, a public figure who radiated strength and independence, who eschewed the conventional female role and forged a new one for herself. On her passport, under “occupation,” she had entered “flyer.” And whenever she was on an airfield, she habitually wore custom tailored gabardine slacks, an open-throated man’s sport shirt with a knotted silk scarf, and a leather flying jacket. They became her trademarks. She was one of the most talked about, fashionable, admired, beloved and emulated women of the 1930s. She was an icon. Her name was a household word. Even the press referred to her more often as not as just “Amelia.” Everyone knew they were talking about the one and only Amelia Earhart. During her brief career, she was always thinking about the next flight, because these flights kept her in the public eye. During her preparations for the round-the-world flight, she told a friend, “I think I’ve only got one more good flight left in me.” That remark turned out to be more prescient than Earhart could know. Nine years later, in July 1937, the famed aviatrix suddenly vanished without a trace on the Lae to Howland leg of her round-the-world flight. Many have tried to discover the ultimate fate of this charismatic flyer, but there is an aspect of Amelia Earhart’s life and disappearance which nobody has explored. I discovered it during my research for my book LEGERDEMAIN: Deceit, Misdirection and Political Sleight of Hand in the Disappearance of Amelia Earhart (Author House 2005). This aspect is almost more interesting than her aviation career and even her disappearance. For, aside from being the First Lady of Aviation, as she was dubbed, Amelia Earhart was also a considerable psychic, or so some believed. Since she almost never discussed this side of her life publicly, information regarding it is scarce. However, through the use of an online newspaper database, I was fortunate enough to uncover a few accounts not seen for nearly 70 years. 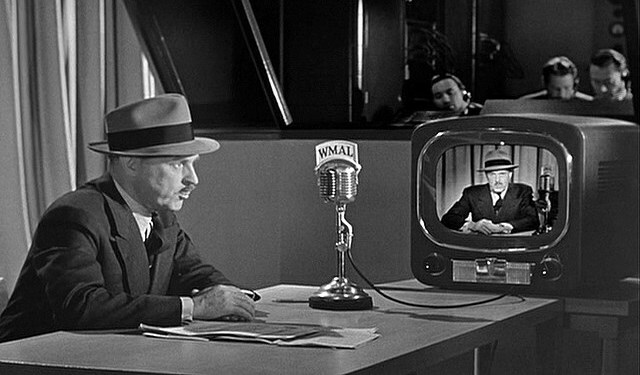 Washington Columnist Drew Pearson appears as himself in the popular 1951 science fiction classic The Day the Earth Stood Still. One development in connection with the recent air crashes which has been intriguing air officials is the way Amelia Earhart has gone psychic. America’s foremost woman aviator has now become the No. 1 seeress of the air. She believes she has developed a contact with the occult world by which she knows what happens in air crashes. Her latest prediction is that May 10 she will make a startling discovery regarding the crash of the Western Air Express plane lost over the Wasatch Mountains on Dec. 15 between Salt Lake City and Los Angeles, and not yet located. Officials at first were inclined to laugh at Miss Earhart’s psychic messages. But her accuracy now has them mystified. When a United Airlines plane was lost just outside of Burbank, Calif., Dec. 27, Miss Earhart called the United Airlines office and told them to look on a hill near Saugus, a little town north of Burbank. There the wreckage was found. Again when the Western Air Express plane carrying Mr. and Mrs. Martin Johnson crashed Jan. 12, Miss Earhart reported the plane to be near Newhall, 15 miles north of Burbank, where it was found. In the earlier crash of the Western Air Express in Utah, Miss Earhart had a vision to the effect that the bodies of the dead had been robbed by a trapper. Two days later, a trapper near Salt Lake City reported finding the wreckage, but then suddenly disappeared without giving the location of the plane. This is the unfound plane regarding which Miss Earhart expects to make a startling discovery on May 10. 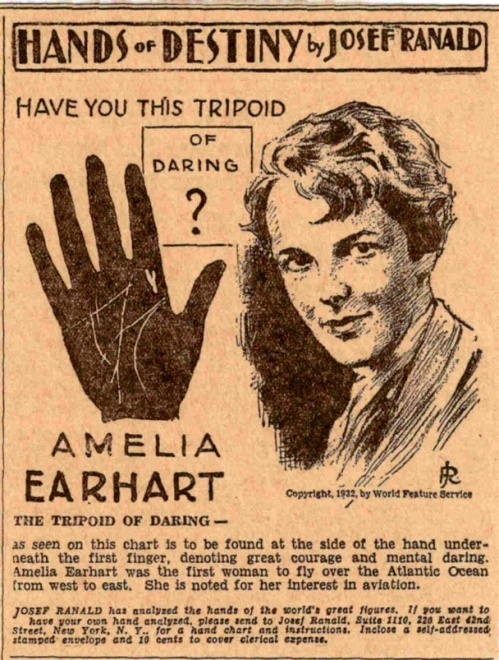 This alluring newspaper advertisement, featuring the alleged right-hand print of Amelia Earhart, calls readers to partake of the services of Joef Ranald, author of the 1932 book, MASTERS OF DESTINY: The Hands and Careers of Seventy-Five Famous Men and Women. A check of newspapers for later in the year revealed news releases in June regarding the missing plane. The Hammond (Indiana) Times for June 8 reported on operations to remove the bodies of the crash victims and retrieve the mail and valuables from the wreckage. Evidently the craft had been discovered within the previous day or so, and interestingly, there was no mention of Amelia Earhart or the trapper who had reported the downed aircraft. The two events are the only ones of Amelia Earhart’s psychic ability to be found in the records so far. They seem to represent the only instances in which Amelia Earhart’s psychic side was revealed. It’s understandable why Earhart would have all but debunked herself in the manner she did, as in a conservative era such as the 1930s a celebrity wouldn’t want to be stigmatized in this way. In those days, to be known as a psychic carried the risk of being thought of as a “kook,” and Earhart’s ambitions allowed no room for distractions such as this. Not long after her interview in the papers, another editorial confirmed Earhart’s concern, when it remarked that it was pleasant to hear that Miss Earhart has denied the reports of her psychic ability. In looking back through the bright pages of Amelia Earhart’s adventurous life, George Putnam remembered something that might explain the curious fervor of all those men and women who wanted to help in his hour of despair. It was simply that Amelia Earhart herself had a fragile psychic quality, some strange susceptibility to conditions beyond understanding. She rarely mentioned it to friends, never discussed it publicly. But whenever AE participated in mental telepathy or psychic experiments to further her curiosity, observers were astonished at the results. And yet she never involved or followed the advice of countless clairvoyants and astrologers who besieged her at every stage of her great flights. And, indeed, Earhart received profuse advice from psychics before her various flights. The feedback was usually in the form of warnings to her not to attempt her flight. And of course, each flight had been successful after all. That’s probably the reason that, despite her knowledge of the reality of psychic phenomenon and her own psychic ability, Earhart disregarded all psychic warnings just before her round the world flight. After Earhart’s disappearance, psychics entered the picture again, via huge numbers of telegrams, letters and phone calls to G.P. Commendably, he gave impartial consideration to every communication, even occasionally spending considerable sums to follow out promising leads. Amelia Earhart alive on coral shoal on one of Gilbert Islands latitude 2 above equator 174 longitude. This message received by Mr. L— New York Medium. Here Putnam stopped in surprise and called his son David to locate the telegram he had received earlier that day. A few moments later, David returned with the telegram and the two compared the position given in that document with the position given in the note from Nova Scotia. Amazingly both positions were the same! 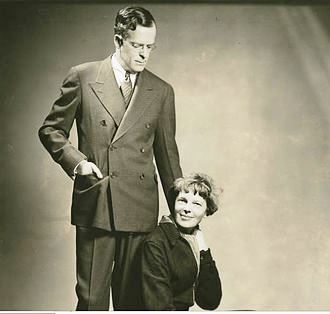 Amelia poses with her husband, George Palmer Putnam in a 1935 photo that must have raised some eyebrows, given the idea, popular among some, that their marriage was little more than a convenient business arrangement. Putnam was actively engaged in the search for Amelia for years, even after he had her declared legally dead in January 1939. He married Jean-Marie Consigny James in May 1939, who filed for divorce in 1945. Putnam married his fourth wife, Margaret Havilland, shortly thereafter, and he died on Jan. 4, 1950. Putnam called the captain in Nova Scotia and the medium in New York for additional details. The details seemed sufficiently promising that the publisher immediately left for New York City, where two days later, he was able to arrange a check of the island by British authorities. A ship dispatched from Makin Island a short while later steamed for the location given in the two communications to Putnam. But eerily, there was no island at the given location. This baffled Captain M— and his former crew members, who all swore they had visited the island a half-a-dozen times. The only explanation that could be put forth was that the island had suddenly been sunk by volcanic activity. G.P. spent $1,000 on that adventure. In September 1937, Putnam was contacted by a friend who was prominent in literary circles, and who was a serious student of psychic matters. Putnam considered his friend of unimpeachable character and integrity. His friend told him that he had encountered a medium of amazing ability, whose performance was yet to be explained. According to Putnam’s friend, the medium in question was a woman who had two voices, her own and another, which came from someplace in her chest. There was a moment of surprised silence. “Oh . . . ” GP said. “Of course,” GP agreed, and a date was set for the next night at 7:30 p.m. The next night the medium appeared at the home of Putnam’s author friend in Los Angeles. Before the séance started, the woman was thoroughly examined for items hidden on her person and mouth taped shut. Untypical of such events, the lights were all kept on, with all participants crowding close to the medium. After just a few moments, a strange voice, like a soft whisper, erupted from the woman, although there wasn’t a sign of motion in the muscles of her throat or chest. The following is the portion of the transcript of the séance which Putnam had recorded, including some of his responses, in parentheses) to specific statements the medium. Voice: Fred was not at fault. It was unavoidable. Putnam: Were they killed instantly? Putnam: What direction from Howland? Putnam: Is it Kingman Reef? Putnam: What will they find? Voice: They will find wreckage, in the water near the island. (Nothing was ever found.) Putnam: What did Fred Noonan call his wife? Putnam: Who is living? Noonan? Voice: He is not dead. He wanted you to know there is no death… Maitland. He is here. Voice: Yes. Maitland and Kingsford-Smith. Putnam: Wiley Post? And Will Rogers? Voice: Yes. Yes. Amelia is among a lot of friends. Putnam: What about her mother? Putnam: Can you ascertain from Amelia what word she used in addressing me? Does the name begin in with the letter “K”? Putnam: This is important; I want to get this right. Putnam: What was it Amelia always carried with her that she didn’t take this time and left it with me? Putnam: What country did the bracelet come from? Putnam: What would she like me to do with the bracelet? Voice: Keep it. You gave it to her, so you keep it. Putnam: Will any of Amelia’s things, like her watch, ever be found? Voice: No. Parts of the plane. Putnam: Will you ask Amelia, please, if she had the Seagraves watch. Putnam: Where is her will? Voice: In the safe-deposit box. With the watch. (Wrong). Abruptly, the séance ended, and George Putnam went home, puzzled by the experience. He was never able to explain the correct information presented by the medium. Had the medium merely read Putnam’s mind, or had she really relayed messages to the publisher from his deceased wife? Jacqueline “Jackie” Cochran, the first woman to fly faster than Mach 1, was born in 1906 and became one of the pioneering women of aeronautics. 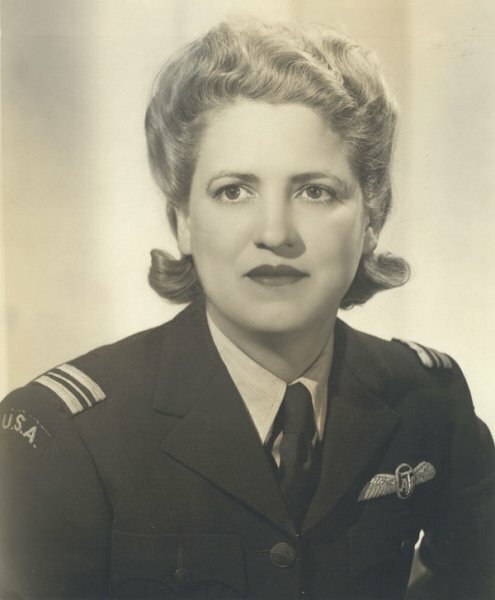 Cochran originally worked in the cosmetics industry and was encouraged to pursue a pilot’s license by her husband in order to travel more efficiently. Always a quick learner, Cochran managed to complete her pilot training in 1932 in just three weeks! She quickly realized that flying was her passion and set about becoming one of the most accomplished pilots in history. In 1935, Cochran was the first woman ever to enter a prestigious annual event known as the Bendix Transcontinental Race, and she was the first woman to win the Bendix Race in 1938. A close friend of Amelia Earhart, she also set several aviation records before 1940, including three speed records and a world altitude record. Probably the most famous psychic incident involved Jackie Cochran, one of Amelia Earhart’s closest friends, who was said to have psychic abilities of her own. After Earhart’s disappearance, Cochran contacted G.P., telling him that she had received strong psychic impressions that Earhart was floating at sea at a particular location northwest of Howland Island. Putnam practically moved heaven and earth to get the navy and coast guard to search that location. But the search was, unfortunately, fruitless, and two days later Cochran told Putnam that it was too late, that AE had perished. Some 25 years after Amelia Earhart’s disappearance, a strange psychic postscript occurred on the Island of Saipan. Researcher, Eugene Sims began employment on Guam, from which Saipan could be reached by air in thirty minutes. As a part of his business activities, he began making weekly trips to Saipan. On one visit, Sims brought his wife with him and as part of a tour of the island, the two were shown Garapan Prison. They were taken to a cell that they were told once held Amelia Earhart. Sims took copious photos of the jail. A few days later, when Sims got the photos back from the processor, he was stunned to see, in one photo of Earhart’s cell a ghostly white figure standing in the metal door frame. Had Gene Sims captured the restless spirit of the long-missing aviatrix on film? And what could she have been trying to tell him? The 80th anniversary of Amelia Earhart’s disappearance approaches, and after all those years, we are left with more than just the mystery of her last flight. We are left with the mystery of Amelia Earhart’s remarkable ability and the even more profound mystery of the human psyche. We begin 2017 with a look at the notorious Weihsien Telegram, as it was known, one of the more sensational claims we’ve seen in recent years. In 2001, this hot potato was relegated to the dustbin of dead-end myth, when researcher Ron Bright definitively disproved the idea that Amelia Earhart had been confined at the Weihsien, China civilian internment camp during World War II. This notion sprang from the 1987 discovery in State Department archives of an unsigned telegram, or “speedletter” to George Putnam from Weihsien in 1945; Amelia Earhart was soon “identified” as its sender by a group heavily invested in the Amelia Earhart-as-Irene Bolam canard. The unsigned telegram reads, “Camp liberated — all well — volumes to tell — love to mother.” Sent from Weihsien, north China, and dated Aug. 28, 1945, this document created a huge buzz among researchers who speculated it could have been sent by Amelia herself. During the ensuing debate within the Amelia Earhart Society, Bright, working with Patrick Gaston, an Overland Park, Kansas, attorney, obtained key documents, witness accounts and other evidence that helped put the lie to this lingering pest of a theory. Before we get to Bright’s findings, which hammered the final nails in the coffin of the Weihsien falsehood, we’ll hear from others involved in the promotion and debunking of this once-popular idea. In 2001,. longtime researcher Ron Bright, of Bremerton, Wash., with a few associates, debunked the Weihsien Telegram theory, which proponents claimed showed that Amelia Earhart was alive in a Japanese civilian internment camp in 1945. In the September 1993 issue of Omni Magazine, Amelia Earhart Society President Bill Prymak offered an informed rebuttal of the false claims by The International Group for Historic Aircraft Recovery (TIGHAR) that Earhart crashed-landed on Nikumaroro Atoll, formerly known as Gardner Island, in the central Pacific’s Phoenix Chain. As for her true fate, Prymak said he had “tantalizing evidence but nothing concrete. We do have a telegram from her to her husband, George Putnam, which was dated Aug. 28, 1945, from a prison camp in China.” Thus, Joe Gervais’ long-discredited claim in Amelia Earhart Lives that Earhart had lived in the Emperor of Japan’s palace before returning to the United States as New Jersey housewife Irene Bolam was transformed into an equally implausible — if less glamorous — scenario. Bright’s findings would later force Prymak and most others to admit their errors, but not before several years of confusion had passed. 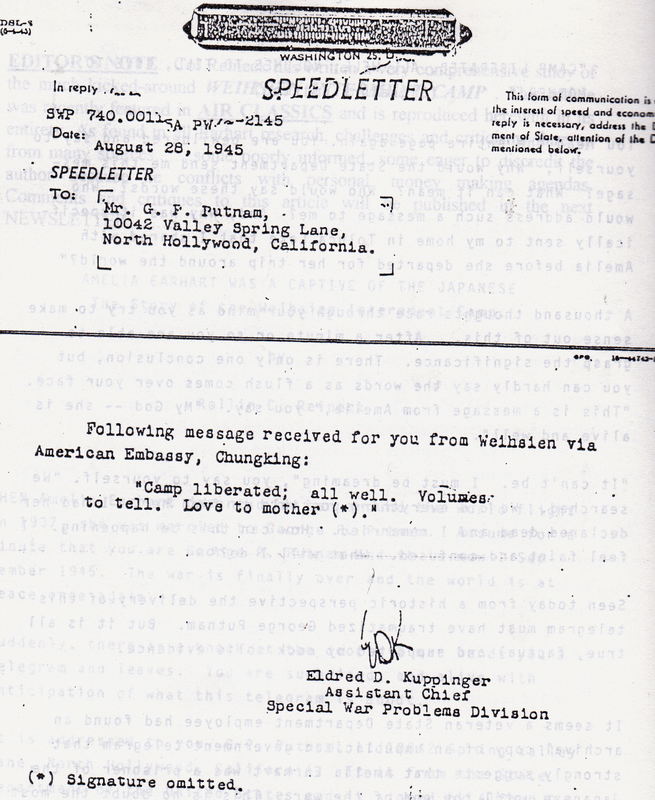 Though Prymak and many of his AES associates believed that the telegram sent to George Putnam “informed Putnam that his wife was alive” in a Japanese internment camp in 1945, others with knowledge soon attempted to debunk this notion. In late July 1993, Devine sent me a copy of a recent letter from Langdon Gilkey, 73, author of Shantung Compound (Harper and Row, 1966) to retired New York Police Department forensic specialist and Earhart theorist Jerome Steigmann, who died in 2003, as did Devine. In 1943 Gilkey was an American bachelor teaching at Peking’s Yenching University, a privately owned Anglo-American school and one of 10 “Christian Colleges” in China. Gilkey was advised by the Japanese that he and other American and British nationals then in Peking would be sent to a “civilian internment center” for their “safety and comfort.” Many people, including doctors, professors, instructors, businessmen, missionaries and travelers were incarcerated in the facility in Weihsien. Shantung Compound is Gilkey’s account of his experience there. Gilkey was released from captivity on Sept. 25, 1945. Undated photo of Langdon Brown Gilkey, author of the 1966 book Shantung Compound, his first-person account of American and British nationals in China who were incarcerated by the Japanese at the Weihsien, China civilian internment center for several years during World War II. Gilkey, who authored 20 books, has been called “one of the most influential American Christian theologians of the 20th century,” by a colleague who taught alongside him at the University of Chicago for 20 years. 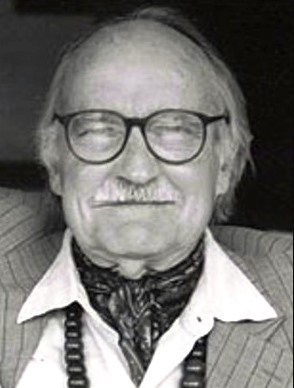 Gilkey passed away in Charlottesville, Va., at 85 in November 2004. Responding to my July 2001 letter asking his clearance to quote him in my 2002 book, With Our Own Eyes: Eyewitnesses to the Final Days of Amelia Earhart, Steigmann provided more evidence against the idea that Earhart spent time at Weihsien. He sent copies of a few introductory pages to The Mushroom Years: A Story of Survival (Henderson House Publishing, 1998), by Pamela Masters, another veteran of the Weihsien “Civilian Assembly Center.” Masters, who was held at Weihsien with her family, briefly discusses the alleged Earhart-Weihsien connection and says she recently located the OSS (Office of Strategic Services) major who commanded the operation to liberate Weihsien in 1945. Pamela Masters’ 1998 memoir, The Mushroom Years, is “the story of a group of a group of American, British, and Allied nationals who were caught in North China and imprisoned in Wei-Hsien (Way-shen) [sic] Prison Camp [sic] in Shandong Province,” according to Masters’ website. The infamous Weihsien Telegram, which caused an uproar in the Earhart research community during the 1990s. Devine had no use for such delusions, nor did he need Steigmann to shed the light of truth on the Weihsien Telegram theory. He already possessed decades-old information that strongly suggested the possible identity of the telegram’s originator, and it certainly wasn’t Amelia Earhart. Seeking to confirm his theory, Devine tried to contact David Binney Putnam in 1993, but learned he had passed away in May 1992. 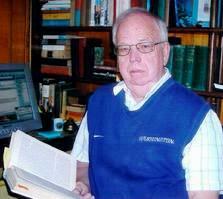 Hoping David’s brother, George P. Putnam Jr., could help clear things up, Devine was initially disappointed. Finally responding to Devine’s inquiries, Putnam told Devine he hadn’t the “faintest idea” what he was talking about. “No member of our family was ever in prison in China during the WWII era,” Putnam told Devine. As it turned out, Devine’s best guess was wrong. Ron Bright and Patrick Gaston initiated a well-executed investigation aimed at nailing the source of the Weihsien Telegram, the details and results of which were initially published in the May 2001 TIGHAR Tracks newsletter. As I’m not a member of TIGHAR, Bright kindly provided a copy for my use, and it was included in With Our Own Eyes. 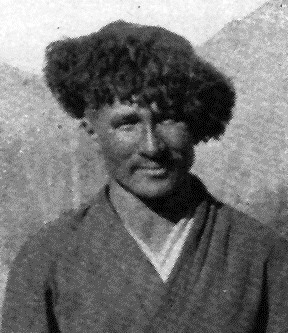 Ahmad Kamal, circa 1935, who sent the “Love to Mother” telegram from Weihsien, China, to George Putnam in August 1945. The speedletter created a sensation among Earhart researchers when it was discovered in U.S. State Department archives in 1987. Bright found that the author of the controversial telegram was Turkish author and world traveler Ahmad Kamal, who was interned at Weihsien from summer 1943 to August 1945. Kamal knew George Putnam well enough to ask him to look in on his elderly mother, who apparently lived in the Los Angeles area, while he was away. Bright also secured what he called “the entire list of the 1,800 plus internees at Weihsien” from former camp administrator Desmond Powers, a Canadian. Needless to say, Amelia Earhart’s name wasn’t on the list. 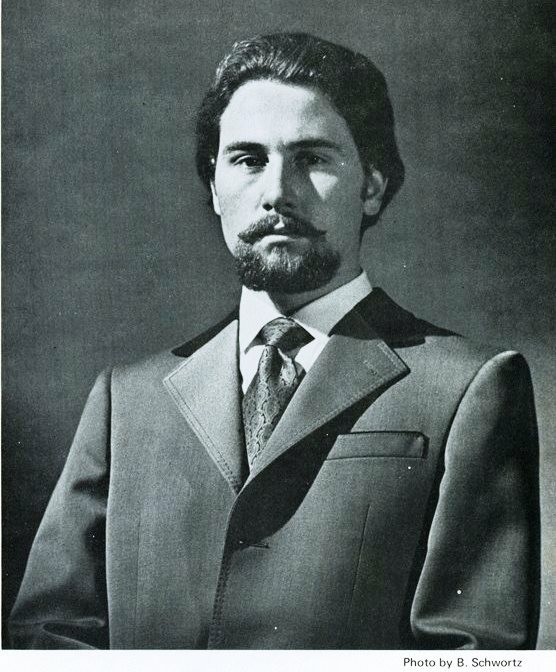 Kamal died in 1989, but Bright found his son, Turan-Mirza Kamal (1951–2004) an American-born classical guitarist and composer, in Southern California, and the veil on the Weihsien mystery was finally lifted. Kamal told Bright his father was a pilot, and kept his airplane at Burbank Airport in the early 1930s, where he met Howard Hughes, George Putnam and Amelia Earhart. Sometime about 1939–1940, Kamal returned to China where he met and married his wife at Tientsin, China. The war broke out in December 1941 and, soon afterward, the Japanese Secret Police captured him and his wife. Refusing to cooperate, they were transferred to Weihsien Camp in the summer of 1943. There they remained until liberated in August 1945. Turan-Mirza Kamal (1951–2004) an American-born classical guitarist and composer, in Southern California, and the veil on the Weihsien mystery was finally lifted. Kamal told Bright his father was a pilot, and kept his airplane at Burbank Airport in the early 1930s, where he met Howard Hughes, George Putnam and Amelia Earhart. According to his son, shortly after the camp was liberated, Kamal sent out two radio messages: One to Scribner and Sons about publishing a book, and one to George Putnam. His son said he has seen either notes or a journal of that message and could repeat it almost by heart — something like “camp liberated, all was well, volumes to follow and love to mother.” The “love to mother” was added, said Kamal’s son, because Putnam had agreed to look after Kamal’s aging mother when Kamal left for China. Mrs. Kamal lived nearby and Putnam was to look in on her. It was an informal caregiver arrangement. Kamal said his father often discussed Amelia Earhart and the mystery of her disappearance, and believed she went down in the sea. The elder Kamal had also told his son that Earhart was not at Weihsien while he was there, from 1942 until August 1945. Kamal was an American, and probably a convert to Islam, according to Pulitzer Prize-winning writer Ian Johnson, author of A Mosque in Munich: Nazis, the CIA, and the Muslim Brotherhood in the West (Houghton Mifflin Harcourt, 2010). Johnson obtained Kamal’s FBI file under the Freedom of Information Act, which reveals that Kamal was born on Feb. 2, 1914, in Arvada, Colo., and his birth name was Cimarron Hathaway; his mother was Caroline Grossmann Hathaway, his father, James Worth Hathaway. According to an interview Johnson obtained with a daughter, James was a stepfather and Cimarron’s biological father was Qara Yusuf, a Uyghur from Turkestan who was much older than Caroline – he was 64 and she 16 when they married. 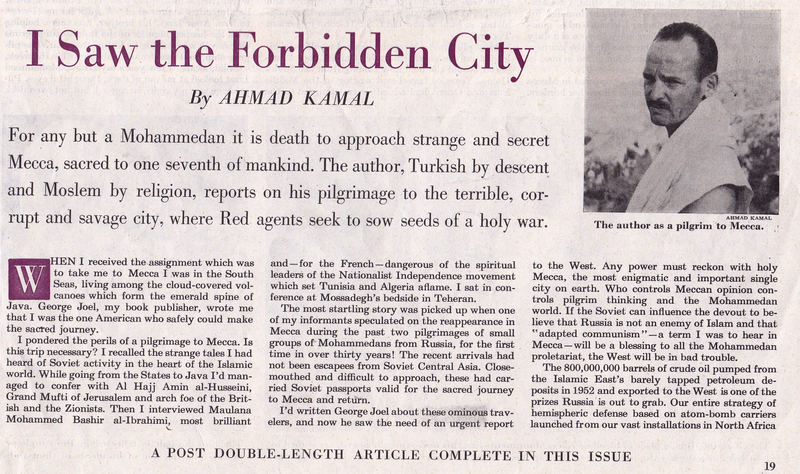 This compelling first-person account by Ahmad Kamal appeared in the Sept. 26, 1953 Saturday Evening Post.